As we are getting near to the end of this month and already webmasters as well as bloggers are getting curious about the next Google Algorithm improvement it is because of the controversial statement given by Matt Cutts about Penguin Updates he said that, “it will be shaking and jerking”. After that conspiracy, lot of webmasters got freshened because, that statement had the power to shake the boots of Bloggers and even SEOs. However, on various webmasters forums the chat is on its peak that Google has rolled out yet another Panda improvement instead of Penguin. What are your feelings, does Google have rolled out yet another fireball towards webmasters, or it is just a normal diminished algorithm change that cannot be named as an update? There are several threads on different Webmaster forums, in which people are arguing about the Google algorithm change, but they aren't sure whether it is Panda or Penguin. After investigating on different ongoing conversations on many forums and blogs, we came across to the conclusion that it is the Panda enhancement. The Following Screenshot is taken from Mozcast which indicates that today’s SERPs weather is extremely prominent due to improvement in Google algorithm. Now after witnessing the above report do you still think that Google has improved their search ranking system? Before you get over excited, let’s differently jump to the conclusion and broke the suspense. 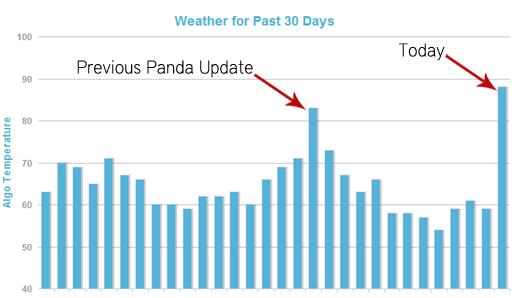 Does Google Panda 4.0 is Updated? We don’t know whether we should call it a rumor or not, but lots of to quality blogs have claimed that Panda 3.9.1 algorithm is updated to 4.0. However, they also mentioned that it is not an official update because Google haven’t provided any news about the algorithm upgradation. To resolve this clutter, shaped by Top PRO Bloggers, Matt Cutts came into action. Therefore, he utilized twitter to clarify that it is not a key enhancement and this change was to improve the diversity of search results. Following is the code of Matt Cutts Tweet. So it’s pretty much clear that there is nothing to be gaga about because it was just a demised algorithm change nothing more than that. Be concise: Sometimes things get serious when we play too much with our content, while writing content make sure that you and make it straightforward and brief. Be one, be unique: Filling your blog with unique content is just like painting your home with new and bright colors. Make sure you write quality posts with a unique touch. Quality Matters a Lot: What you would do if your dinner is not of high quality, similarly your content should be tasty and delicious. Don’t Worry, Just Concentrate: Sometime over precautions kills a man because we are unable to concentrate on a certain thing. Don’t worry about any animals that Google owns just build quality content. According to my views, we should not worry much about any changes in Google search ranking methods because the more we think the worse it would get. Hope this article will help in building awareness till then peace, blessings and happing Googling. My Visiters Increased 25% From Last 10 days. I am getting more visitors than before by Google.